Through an invitation-only competition among some of the nation's leading art museums, the Andy Warhol Foundation for the Visual Arts selected the Cantor Arts Center as the permanent home of Warhol's archive of contact sheets and negatives. As a university art museum situated at a campus with accomplished faculty and students, the Cantor is ideally situated to care for the collection, facilitate new scholarship and engage with broad audiences through new exhibitions, programs and publications. 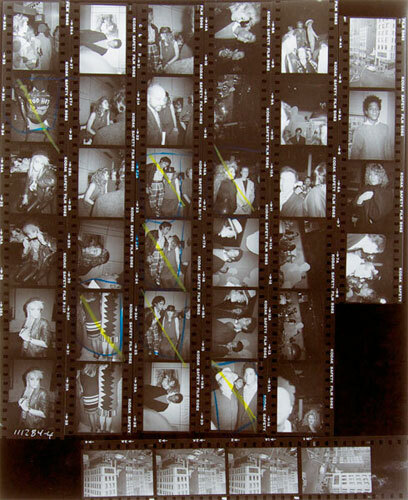 From 1976 until his death in 1987, Warhol used his Minox 35EL camera to meticulously document his daily life. This acquisition of 3,600 contact sheets and corresponding negatives of photographs represent the complete range of work and include images of the celebrities and artists of the era, such as Truman Capote and John Lennon. Visible are the marks he made to reject an image, with an "X," or print it as a photograph, with a circle. The photographic archive builds upon the Cantor's existing collection of Warhol works and reaffirms the university's preeminence in the study of the history of photography, from Eadweard Muybridge to Carleton Watkins to Andy Warhol to Robert Frank to Lee Friedlander. A consortium of departments, faculty and professional staff will collaborate on programs for this revolutionary teaching resource (several professors include Warhol in their curriculum). Art and art history Professor Richard Meyer and Connie Wolf plan to teach a course on the archive in spring 2015, and other courses are in development. The inaugural exhibition and a major international symposium are scheduled for 2017, the 30th anniversary of Warhol's death. Funds are being raised for a permanent, restricted endowment dedicated to the archive's storage, conservation, digitization and staff. The Cantor will digitize the full archive and make it accessible online. Warhol was born in Pittsburgh, Pennsylvania, in 1928, and died in 1987 in New York City. He carefully cultivated his public persona as well as his broad social network of people with star quality, such as Yoko Ono, Liza Minnelli and fellow artists Keith Haring and Roy Lichtenstein. Part of the emerging pop art movement, Warhol explored the nuance of cultural ubiquity through his images of mass-produced objects such as Campbell's soup cans and celebrities such as Marilyn Monroe. Warhol was a hugely influential figure in contemporary culture and an incredibly prolific artist in many media: film, photography, music, performance, printmaking, drawing and painting. He had realized early success as a commercial artist in New York as an independent artist and worked out of a studio known as The Factory. His first solo exhibition in 1952 was at the Hugo Gallery in New York. He co-founded Interview magazine, designed record covers for the Rolling Stones and produced his own TV programs for MTV and cable access. Looking forward, Mitchell said, "These three gifts of art by world-class artists strengthen the Cantor's collection across many media, and they will spark exciting exhibitions and fresh research into how complex 20th-century American art really is." The Cantor Arts Center at Stanford University announces expanded public hours. The Cantor is now open six days per week, with visitor hours also on Mondays. New hours are Wednesday through Monday 11 a.m. to 5 p.m., plus Thursday evening until 8 p.m. The Cantor will be closed only on Tuesdays, Thanksgiving Day and Christmas Day. The Cantor continues to offer free admission.